Very few Kerry Estate or Kerry Tenant Rentals have been digitised but details of some are available in various archives. During the 18th and 19th centuries, Kerry became predominantly owned by English landlords and by Anglo-Irish families who were granted land in return for various services. These lands, or estates were typically divided into small-holdings which were rented or leased to tenants. The private papers of the owner of these estates contain many useful records including: Rentals – lists of tenants and associated rent ledgers details payments ; Estate maps on which the names of the occupiers of specific holdings are marked; Lease agreements which generally only apply to large tenants, who may have sub-divided their properties into small-holdings; Letters relating to estate business, eviction or other matters but which may refer to individuals. Kerry estate records are rarely indexed. A major resource for information on estates is in the Landed Estates Database compiled by University College Galway. Boyle: Rental of the estates of Richard Boyle, 1st Earl of Cork in Munster counties including Kerry 1641-1643. 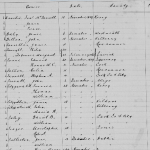 NLI: Lismore Papers MSS.6247-6253. 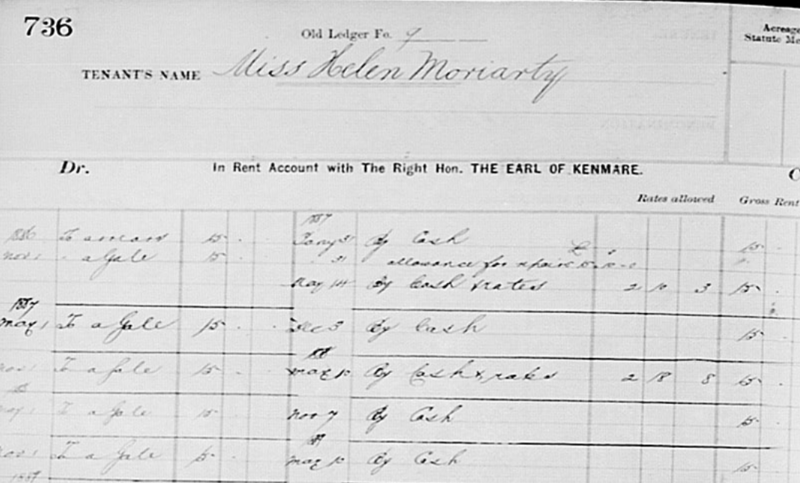 Crosbie Estate (Ballyheigue): Rentals (1857-1917), including Tenant Purchase Loans Account Book, 1904, KLA. De Moleyn: twenty one deeds relating to properties of the De Moleyn family, (Lord Ventry), Co. Kerry 19thC. NLI: D6723-43. Fitzgerald (Knights of Kerry): The original Fitzgerald Papers are in family possession. There are microfilm copies in the National Library of Vols 1-17 + Index (1741-1849) POS9082. Fitzmaurice (Lords of Kerry): Papers relating to the family of Francis Thomas Fitzmaurice, 3rd Earl of Kerry, resident in France, including accounts and several rentals of estates in Co. Kerry, Paris: Nationales, Fonds T. Cote 451 (1-3,8) NLI n. 1087-8, p. 176-7 [Microfilm copies at NLI N.1087-8 p. 176-7, n.6388-6392, p. 7392-7396]. 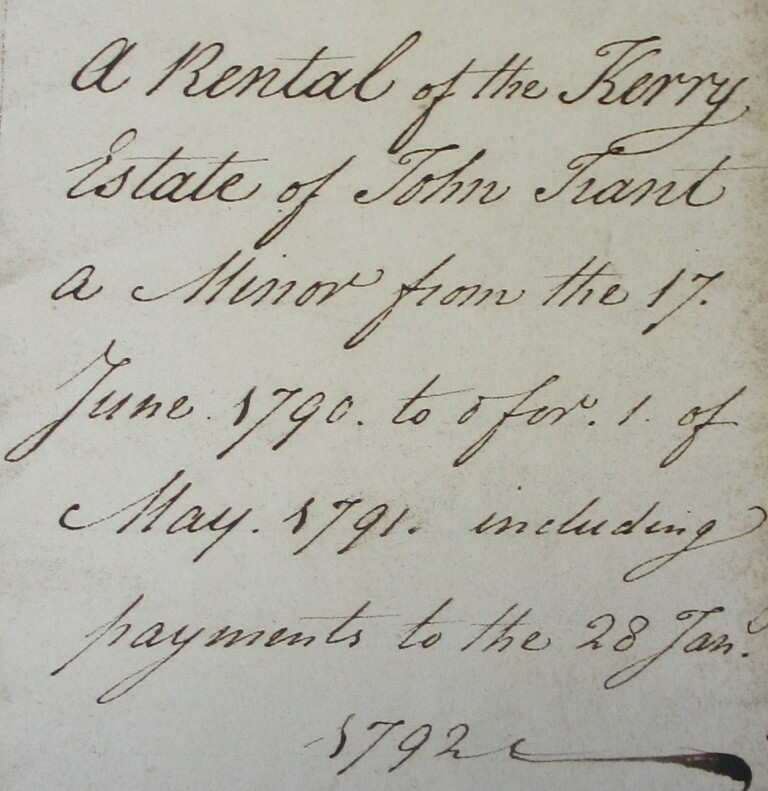 Rental of the Feale Fishery, Co.Kerry, early 19th c. NAI: M.3296. Gun Browne papers including 1914 schedule of encumbrances, accounts 1880s, tenancy particulars (1908) and receiving rental of 1885. 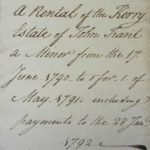 Rentals and accounts of the Herbert estate in Cullinane near Killarney including rent roll 1733 , of Sir F. Brewster’s estate, 1780-1812. 2nd pack is a rental of Mr. asgylls estate 1709, thirty six tenants for Killarney and sixty nine for surrounding areas. NAI 1854 (1-24), 1741-1752 Rent & Accounts M. 1864. Kenmare: The Kenmare papers (Browne family) deposited in PRONI, which include most of the former contents of the Estate Office at Killarney, Co. Kerry, amount to well over a ton of records. 1587-1958, comprising c. 475 volumes and files (53 of them of huge proportions) and c. 3,250 documents, maps, plans and surveys PRONI Kenmare Papers D4151. Introduction online www.proni.gov.uk/introduction_kenmare_d4151-2.pdf. Locke: Surveys, valuations and rentals of the Locke estate(formerly the estate of the Earl of Kerry) in Co. Kerry, 19thc. Set of maps of same by Richard Frizell, 1762-5. NAI 3297-3308. Map of the Locke estate in Carrigcannon and Lyreacrompane Co. Kerry by N. Bath 1796. NAI:M3309. Rental of Locke estate 1801 & 1824m M.3284, M3286, NAI. McCarthy More: Rent roll of the McCarthy Mór estates in Co. Kerry1673. NAI. M. 1676. 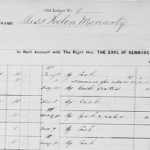 McGillicuddy of the Reeks: Rent Ledger (1881-1888), Rent Account Books (1780-1871 and 1857-1858), Estate Account Book (1848-1859) and Estate Labour Books (1857-1864) KLA. Ormonde: Extracts from the Civil Survey of Ireland of lands claimed by the Dukes of Ormonde in Counties Tipperary, Kilkenny, Carlow, Dublin, Kerry and Waterford. NLI: Ormonde Papers Ms. 2560. Spring Rice: Accounts of the Spring Rice Estates in Cos. Kerry and Limerick 1785-1799, 184 mainly large tenants. NLI: Ms.596. Rents of the Spring Rice estates in Cos. Kerry and Limerick 1787-1792, 1802. Approx 20 tenants in 4 townlands of Ballymacelligott and Galey and rent details. NLI: Ms.602. Miscellaneous accounts re the estates of the Spring Rice family in Cos. Kerry and Limerick, 1806-1812. NLI:587. Copies of miscellaneous correspondence of Stephen Edward Rice, 1806 and summary rents of Coolkeragh, Co. Kerry, 1806-23. Mainly house and farm expenses but good lists of labourers 1808/9. Copies of letters in bound volume and rental of Coolkeragh (Civil Parish of Galey), NLI: Ms. 605 Monteagle Estate Accounts 1870-73. NLI: Ms.581, 590. Stoughton: Documents of Irish Naional and Land League and Ladies Irish National Land League relating to evictions on estate of Thomas A. Stoughton, Ballyduff, Co. Kerry. 1881. NLI: Ms. 18,456. Thank you Kay for providing this list of Estate Papers for Kerry. So helpful to discover what is available for the county. 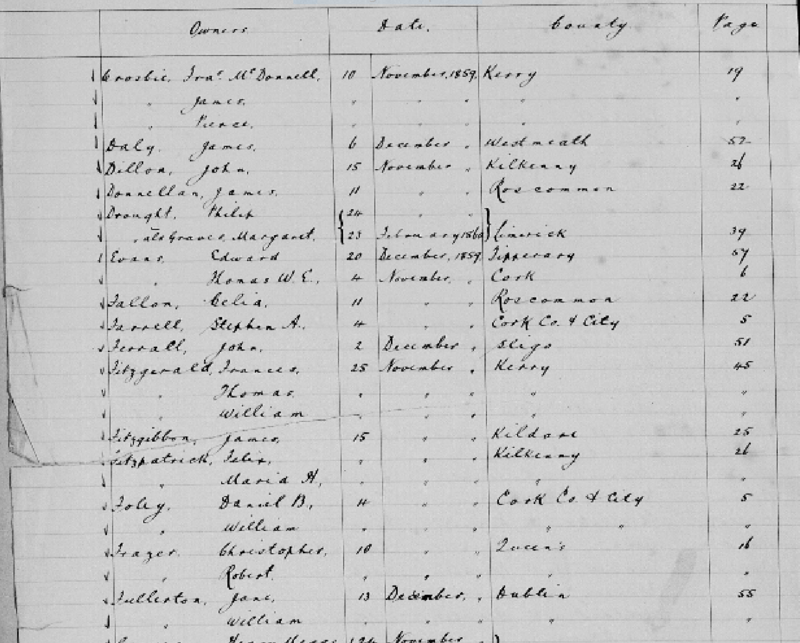 Would the records of the Blennerhassett’s and the Spring-Rice’s be those that would most cover the townlands of Ballymacelligott? For example: Arabella, Flemby or the area that is in the vicinity of St. Brendan’s at Clogher. I am looking for Healy records in the area. Greg, as far as I can see, Arabella was owned in the 1850s by the Peet family but it was sold in the Encumbered Estates courts in 1886 and more in 1889. The only way to follow this up is a physical ‘look up’ in the Valuation Office. Each change of ownership (whether tenant or owner or landlord) is marked through the years from the time of Griffiths onwards to the 1960s. It may be that your Healys were able to purchase it at that time. Flemby was owned by the Ballyseedy Blennerhassetts. this come about? I understood from my cousin that they bought the land. By the turn of the twentieth Century, Landlords were for the most part selling their estates to the Land commission who in turn were redistributing the land to tenant farmers through 30 year purchase leases. By 1910 most Farmers in North Kerry were now farming their land. Agricultural prices prior to World War One was relatively strong.